9 Thanksgiving Dessert Recipes Worth Pinning | Happy Thanksgiving! Today I have a round up of desserts I’ve made over the last few years. And, as immodest as it may sound, I’m calling it 9 Thanksgiving Dessert Recipes Worth Pinning! Feel free to pin this main pin, or pin any of the individual long pins. Each is linked to a pin on Pinterest. Each of these recipes had me and other folks who I shared with coming back for more. Most of these dessert recipes are pumpkin, but there’s also an apple pecan cake, pecan pie eclairs, and some gloriously rich chocolate pecan cookies. Whether you make one of these desserts as the star of the show or you make 2-3 for a dessert buffet, I think your family and friends will be very happy with the selection. As soul-satisfyingly comforting as bread pudding, but with a lighter texture that makes it appropriate for the end of a heavy meal. I do love a good individual dessert, and the combination of caramel and pumpkin in this light mousse is hard to resist. Add the streusel for texture and even more flavor, and you and your guests will be very happy indeed! 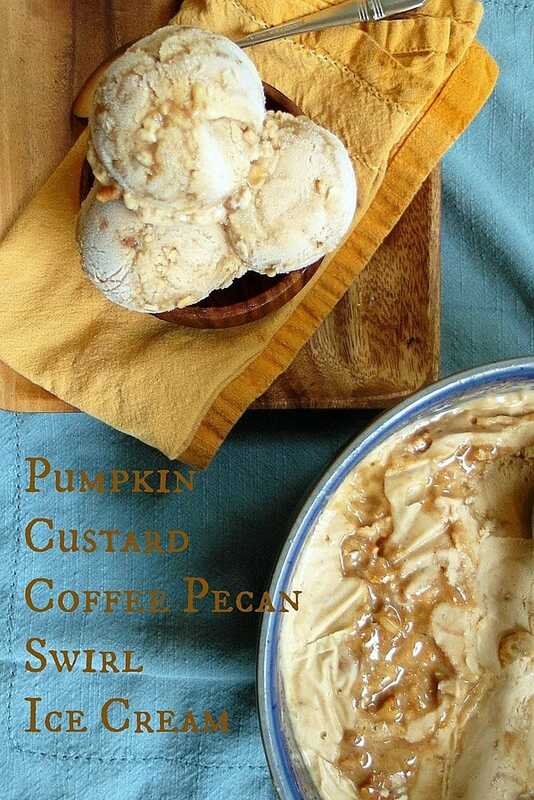 This ice cream tastes like a Thanksgiving dessert buffet with two favorites swirled together: pumpkin and pecan pie. Don’t miss it! If you’re in the market for a rich, decadent chocolate cookie that sparkles on the outside, this recipe is for you. I was inspired by Gesine Bullock-Prado’s Starry Starry Night Cookies. These do not disappoint. This cake is gloriously fall-ish, and while sweet and decidedly a dessert, it is a bit restrained since it’s a “naked cake.” Firm yet moist, this cake slices beautifully and is also very pretty. Yay! This recipe is from my friend Barbara Schieving’s eCookbook, Simply Sweet Dream Puffs. I have to say, the combination of rich, gooey pecan pie filling together with the light and airy whipped cream in the crisp pate a choux shell makes these pretty darn irresistable. And no sharing! If you like pumpkin pie but aren’t into the crust, this pudding is for you. Served with crunchy pecans and lightly sweetened whipped cream, these individual desserts are sure to please. Plus, they’re made on the stove top. I named this flan The Most Interesting Flan in the World, and it’s pretty much true. Even pumpkin pie nay-sayers will want more of this delicate yet impressive-looking flan. Perfect for a Thanksgiving dessert buffet, these whoopie pies from Dorie Greenspan’s new cookbook Dorie’s Cookies are brought into Adult-land with the addition of fresh chopped cranberries to the batter. Their occasional tart bite really balances out the sweet filling. I hope you’ve enjoyed this round up of 9 Thanksgiving Dessert Recipes Worth Pinning, friends! Thank you for taking the time to read today. Take care, and have a lovely day.